This issue takes Daredevil to new levels of batshit crazy and does it in style. The final scene was one of the most shocking moments I’ve ever read in this book. However, there’s a fine line between going to new crazy extremes, and straying too far from the core of the book and the main character. With Diggle’s handling of the story, that’s not a problem, but it very easily could have been. What we get is something very exciting that has me on the edge of my seat. With this issue, we see Matt reacting to the news of his friends’ recent string of “bad luck” (i.e. Foggy being disbarred and Dakota losing her investigator’s license), which strengthens him in his resolve to go head to head with Norman Osborn. Like I mentioned in the review of the previous issue, the current story arc is thematically similar to Bendis’s “King of Hell’s Kitchen” and those elements are even more prominent here. 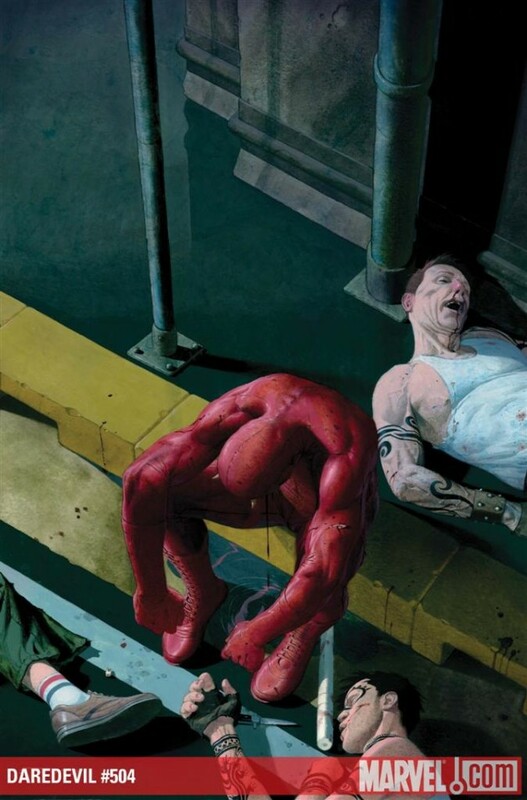 I’m not suggesting that this is in any way repetitive – the fact is that what we’re seeing here is much more extreme and quite different – but it does mean restoring the Daredevil to the take charge character many have been missing for the last couple of years. Of course, just like then, the main characters actions are driven by rage, frustration and a generous dose of hubris. Daredevil is now firmly entrenched in the goings on of the larger Marvel Universe, but his old enemies are still hanging around and keeping busy throwing gravel into the machinery that is the Hand. I’m probably not the only Daredevil fan to feel conflicted about Daredevil’s involvement in major cross-over events, but so far it all works. In fact, I can see the new status quo and Daredevil’s higher profile bring in new readers. I just hope that this will not have to be at the expense of the not-your-typical-superhero feel of Daredevil that so many of us enjoy, and I, for one, am really looking forward to seeing Matt out of costume in the next arc. This brings me to my only real criticism of Diggle’s run so far: The main character, though clearly featured center stage, feels strangely absent. I don’t know if this is because the larger plot has him acting in ways that don’t make it clear to the reader what his line of reasoning is at all times, or if it might be the relative scarcity of internal monologues. Either way, there is something of a contrast between how familiar characters like Foggy and Dakota feel, in both this and previous issues, and the comparatively more distant Daredevil. I think this will probably be less of a problem for me in future issues, but I find myself missing Matt Murdock right now. For some closing comments on the art, Roberto de la Torre is back as the sole artist this issue (with Matt Hollingsworth on colors) and hits the ball out of the park again. You can tell that he’s still playing with the looks of certain characters, such as Dakota who looks quite different from one issue to the next, but he’s clearly created his own very distinct style for this book that I really like. One scene that stands out to me, aside from the haunting final page, is the one that shows Daredevil and the Hand appearing before the people of Hell’s Kitchen. I’m also a fan of de la Torre’s interior shots of the sewers that Matt now calls home, and the artist will be missed when he takes a break next arc. Christine, why are your reviews always so right? This one is no exception and I’m glad you pointed out, right off the bat, that Matt is more off his rocker than he has ever been. He may have been King of Hell’s Kitchen in name before, but he’s now King in fact and has decided to make his authority felt. Why are readers and reviewers making such a big deal of Matt interacting with the Dark Reign status quo? It seems that this has been overstated a great deal. If you replaced Norman Osborn with Kingpin in this storyline, this would be a cliche (and I don’t mean that pejoratively) DD story. He’s a powerful figure in NYC who has ground troops and hired Bullseye to kill people and get DD’s attention. I don’t see Osborn as anything BUT a Kingpin replacement. We don’t see Avengers stuff. We don’t have super-villains. We just have Bullseye, a would-be mastermind, and some expendable grunts. This is a DD story; it’s not a Dark Reign story. I’m surprised that readers are reading it as anything but that. P.S. Why are they living in the sewers? They’ve got a huge office building. It strikes me as just as likely that the cops will break into their office building as their sewer hideout. The sewers can’t be THAT SECRET and Matt seems ok with building a huge complex to (in part) house prisoners anyway.